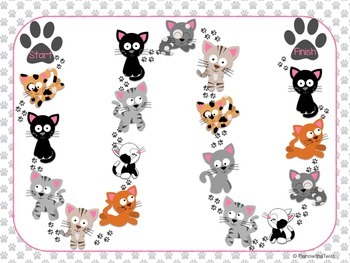 Furry Friends bundles Kitty Rhythms and Puppy Notes into one, money saving bundle! 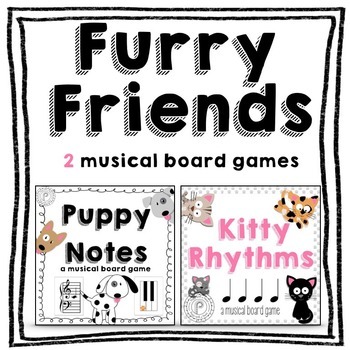 Kitty Rhythms music board game will help reinforce your student's understanding of 4/4 time, quarter, half, dotted, and whole notes as well as eighth, sixteenth, triplet rhythms. Mix and match the 45 different measures to best suit each student! 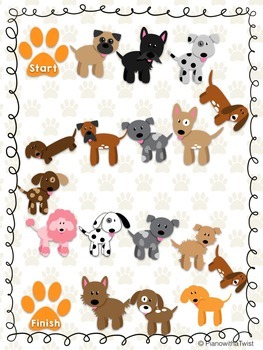 Puppy Notes board game will help reinforce your student's understanding of the Grand Staff, from Bass E to Treble A, as well as the piano keyboard from C-B. Both games take under five minutes to play and works well for private instrumental lessons or as a music center. Between these two games, you will be able to review concepts for your entire studio or classroom! Want three ways to save some money? 2) Follow my store! I mark down all new products 50% for 24 hours after posting. Click the green star next to my store name to scoop up some great deals! 3) Follow me on Facebook! I often post freebies and other great offers exclusively for my Facebook followers!